« When will Steve Jobs open up the AppleTV? Pandora has launched its new ‘anywhere’ platform, which will see the music discovery service being available to devices beyond the PC — both mobile and around the home. If you’re not familiar with the service, Pandora is based on the Music Genome Project where a group of experts have analyzed the component parts or ‘genes’ of the musical works of over 10,000 artists. The result of which is that you can tell Pandora to create a radio station based on songs that have similar ‘genes’ to a chosen artist or track. 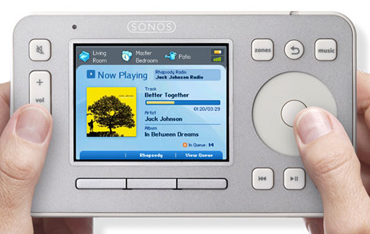 However, until now, aside from a partnership with Slim Devices (makers of the excellent Squeezebox), Pandora was only available through a flash-compatible web browser. At yesterday’s announcement, the company unveiled two new partnerships: Sonos for streaming Pandora around the home, and Sprint for mobile. Both the mobile and home streaming versions fully integrate with Pandora on the web, so for example, everything you create, rate or bookmark on your phone, also appears the next time you’re back on the web, and vice versa. Pandora on Sonos is available as a 30 day free trial, and then to continue using the service will cost $36 per year. 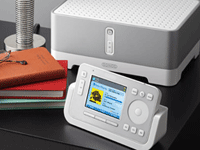 Existing Sonos customers can download a free upgrade to add Pandora compatibility. Sprint will initially offer the service on five handsets for a monthly subscription of $2.99 on top of your existing data plan, and by the end of June, Pandora will be available on all of the Sprint Power Vision phones. Looking to the future, Pandora will come to more devices, including an as-yet-unreleased WiFi-based portable music player powered by Zing, and designed by SanDisk. In fact, Pandora’s ‘anywhere’ strategy reminds me a lot of something Steve Jobs said during last year’s announcement of the AppleTV: Apple is in your den, your living room, your car, and your pocket. It now seems Pandora wants the same. Will audio ads on Pandora help it swim back across the pond? How do I get Pandora on my Blackberry. It’s a sprint system. It’s a 8830 World edition.